Weston's Max Molinsky drives against Norwalk in a preseason scrimmage. Molinsky scored 17 points Friday in an 87-57 season-opening home win over Stamford Academy. To call the Weston boys basketball team's non-league home game Friday against Stamford Academy a nail-biter would be a bit of a misnomer. Weston was in the driver's seat from the tip-off, leading 43-19 at the half before eventually steamrolling its way to an 87-57 season-opening victory. Stamford Academy is now 1-1. "It was a complete, overall team effort all the way down the bench," said Trojans coach Mike Hvizdo, who made a successful debut after taking over for Ryan Errico earlier this fall. "We were playing at 110 percent intensity for the entire game." 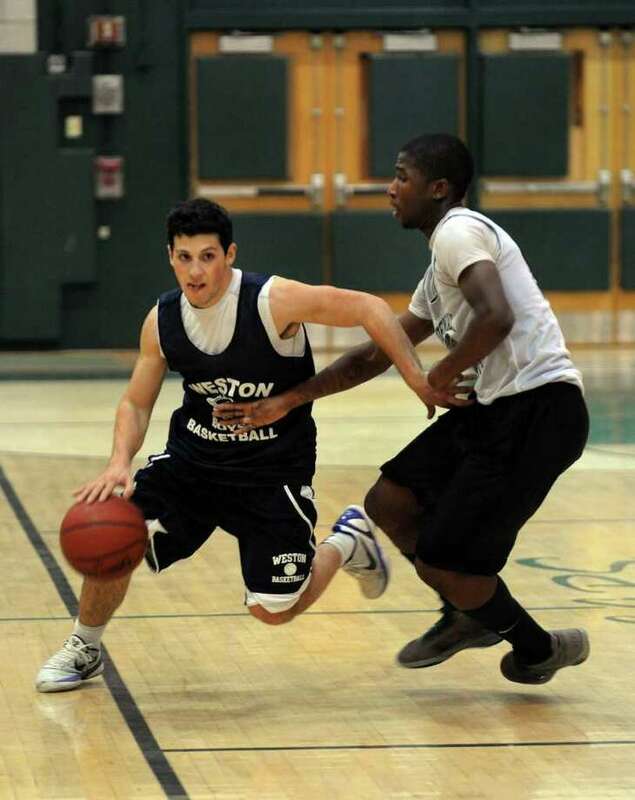 Spearheading Weston's charge was senior captain Max Molinksy, who was All-SWC Honorable Mention the past two years. Molinksy controlled the game from the point, scoring 17 points, while junior shooting guard Charlie DiPasquale tallied 19. Molinsky was a paradigm of the intensity that Hvizdo previously described, never letting up even as his team's lead grew further and further into the double digits. With 7:30 left in the third quarter and his team leading by 24, Molinsky dove to the floor after a loose ball, narrowly missing a collision with his team's bench. "When I dove for the ball, I was responding to Coach Hvizdo's intensity," Molinsky said. "He insisted that we come out during the second half matching Stamford Academy's intensity, so I wanted to set the tone for our team." Molinsky did just that, with Weston never letting up. The Trojans capitalized on Stamford Academy's abundance of turnovers, many of which were forced by the Weston's constant, unrelenting pressure. However, this same pressure caused what ostensibly was the only flaw in their play. The Trojan defense fouled frequently, and was in the double-bonus by the beginning of the fourth quarter. "We're going to work on our defense and make sure we stay strong for four quarters, it got a little slippery there during the third quarter," Hvizdo said. Meanwhile, Stamford Academy was carried by a 24-point performance from junior Shyquinn Dix, but in the end was simply outmatched by the stronger, deeper Weston squad. "We're a brand new team, and we knew we were coming up against a professional, storied program at Weston, so in the end I'm proud of how we played," Stamford Academy coach Michael Hanley said. Weston hosted Bethel last night after press time and play at New Fairfield Friday at 7 p.m.